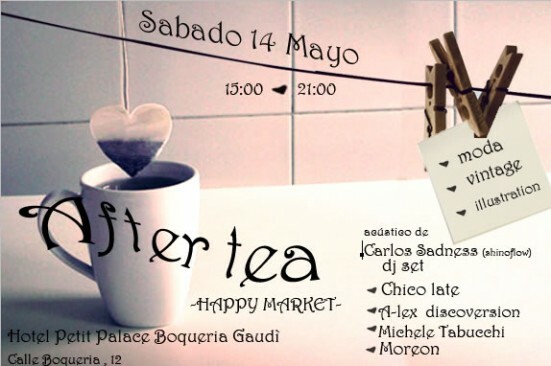 This article is about the After Tea Barcelona market in May 2011. You can still read what Rouge had to say about why she started the market below. But for information on recent events check out the After Tea Facebook page. I first heard about After Tea only yesterday from Colin the Chiropractor. He likes to share the love. He had some fliers in his practice, right next to my cards in fact. After Tea no. 6 is this very Saturday 14thMay. I spoke to the organiser, Rouge Francesca Zambito, to get an idea of what to expect. Why did you start After Tea? And how do you choose who’s there? Sounds like a perfectly pleasant way to spend a Saturday afternoon to me. And in the beautiful surroundings of the Hotel Petit Palace Boquería Gaudí (c/ Boquería, 12). Do make sure you go to the right hotel though. The Hotel Petit Palace Opera Garden is at number 10. I’m going to try and get down on Saturday but if you do go please let me know what you thought by leaving a comment. After Tea, 3pm-9pm, Saturday 14th May. 1€ entrance fee. Hotel Petit Palace Boquería Gaudí, Carrer de la Boquería 12 (esquina con c/ Quitana), 08002. Keep up to date with After Tea on Facebook, at the After Tea Blog or you can just email them. And if you’d like to find out more about Shinoflow check out his Facebook page or follow him on Twitter. He even has his own Wikipedia page! Hey, I am interested in becoming a participant of the market, as a seller. When is the next Happy Market? How much do you guys charge for the space? Hi Gabriela, there was one on Saturday! I suggest you get in touch with Rouge via email or the After Tea Facebook page. Both links are at the end of the article.